Steeped in essential fatty acids, vitamin E and natural anti-oxidants, maritime pine seed oil oxygenizes cells deep-down, replumps the epidermis and so is effectively instrumental in the delaying of skin aging, giving the skin suppleness and vitality. It also protects tissue by combating exterior insult and free radicals. 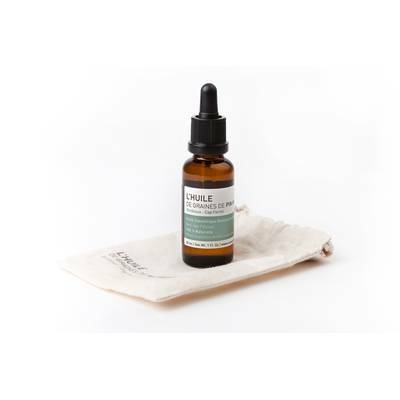 Being perfectly organic and hypoallergenic, maritime pine seed oil has shown amazing affinity with skin. It is quickly absorbed and has a delicate botanical « french seaboard » smell. Plant-based oil with exceptional virtues, L’HUILE DE GRAINES DE PIN MARITIME® is a restructuring and anti-aging companion-in-arms for dry, combination and sensitive skin types. Daily-use, morning and/or night.